Initiated into the Tridion ways at a young age, Robert has traveled the world using his Tridion knowledge to help other new Tridion initiates learn the secrets of building websites with the Tridion CMS. He also organizes the Tridion Developer Summit, where the Tridion community gets together to share their stories and experience. Site labels and other resource strings are something we can manage in Tridion and the SDL Tridion Reference Implementation (STRI) also allows us to manage these key/value pairs in 2 ways. The sample website uses a dedicated Schema for the resources and hardcodes fieldname / fieldvalue in the Schema. The other way is to create a classic config Schema with a multi-value embedded key/value pair Schema. In the CMS you can find the example resource strings in the Component located at ‘\100 Master\Building Blocks\Settings\Core\Site Manager’. To add a new resouce string, we should edit the Schema and add an additional field to the Schema. How do we use the existing resource strings in the MVC app? And after we change the value of a setting or resource string we need to publish the Page ‘\400 Exmaple Site\Home\_System\Publish Settings’. Create a Component using the ‘General Configuration’ Schema. The ‘Configuration Name’ field is not used. Link the new Labels Component from the step above to ‘\100 Master\Building Blocks\Modules\Core\Admin\Core’ in the Resources field. The ‘core’ here refers to the ‘Module name’ of the ‘Module Configuration’ Component at ‘\100 Master\Building Blocks\Modules\Core\Admin’ and the Module name is taken from the Path of the Component. It is also the Module in the Publish Settings Page. The ‘contactUs’ is the Key of our label. Uploading images and PDF files into Tridion is easy, but sometimes we want to restrict the size allowed for these uploads. For example, it’s not cool to upload a 5MB image to the homepage of our website. In this article I will present an approach using the Event System to give a warning message to users when the filesize is too big. The filesize is configured in the Publication Metadata and also a default one is set in the code. Create a new Metadata Schema or add the following fields to your existing Metadata Schema. This is not mandatory, but if you want to change the default filesize values, then it is recommended to do this. It also allows you to set very high values (or low values) for 1 Publication. 1. 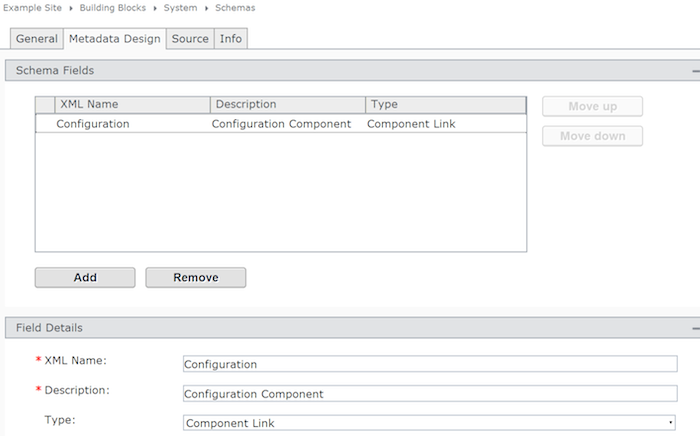 Create a new Schema, Configuration. 3. Add Configuration Schema to Publication and fill in values. The Configuration Manager class from Mihai comes with a nice XML configuration. See below for it. The filename I have is EventSystemComponentSave.dll.config. This must be the same as your Event System DLL. This is the same to install any Event System DLL on your Tridion 2009 / 2011 instance. 2. Copy EventSystemComponentSave.dll to the Tridion\bin folder (or another folder of your choice). 3. Copy the EventSystemComponentSave.dll.config to the Tridion\bin folder (or another folder of your choice). 5. Open the Services.msc and restart the ‘Tridion Content Manager Service Host’ service. Adding content validation rules to the Event System is easy and also provides a better QA for the quality of content being uploaded to our website. In this example we saw how we can easily restrict the filesizes of Multimedia items being uploaded into Tridion. We also saw how easy it is to use a Configuration schema in our code and use the Configuration Manager to cache these settings. I hope this article gives you some new ideas and helps you keep the file sizes under reasonable limits in your Tridion system. Upgrading Tridion 2013 to 2013 sp1 is a fairly simple process. However, an issue exists in the installer and if you don’t take the following step, the upgrade installer will fail with a mysterious message. Then after the upgrade merge any custom settings in the file, such as Event System config, GUI Extensions, or Razor Meditator. This is much faster and better than uninstalling 2013 GA and installing 2013 sp1. Are you manually setting up a Tridion Deployer and using a guide such as Nuno’s excellent post titled Manually configuring a Tridion 2011 .NET Content Deployer Instance? Is it working? If so, move on, this article is not for you. If not, or you would like to learn how to troubleshoot a Deployer to publish to the Broker Database – read on. The Deployer can run as a Windows service or a Website. In this article I discuss the option to run it as a website. I prefer this option as it allows me to run multiple Deployers on 1 machine and I also feel I have more control over it. Read Nuno’s post above for details about how to setup a manual Deployer. I’m going to highlight a way to debug the Deployer and describe one tiny issue that costs me hours of frustration. This tells my Deployer to put the logs for it (and not for anything else) in the log folder. This is not the default setting and I do suggest you change it to a specific folder per Deployer. After changing any config file we need to restart the Deployer. This can be done by recycling the App Pool or simply doing an ‘iisreset’ if you’re on your own local dev machine. The other thing to notice is my license file is in the config folder. And here was my fatal mistake – my license file was called ‘cd_license.xml’ and Tridion assumes it is called ‘cd_licenses.xml’ or I can manually put the name in on the bottom of the cd_storage_conf.xml config file. Big thanks to Mihai Cădariu for Yet Another Tridion answer that saved me time and my sanity. Tridion uses Filesystem bindings (and not the DB ones in the config file you specified) as a fallback and default when it cannot find or load the cd_licenses.xml file. It logs this in the cd_core.log file and not the cd_deployer.log file. In fact, the cd_deployer.log file looks normal and doesn’t give us any clues it’s using the fallback Filesystem Deployer due to a license issue. Tridion deployment is at the heart of every Tridion implementation. Setting up and configuring a Deployer is a task often done by Developers on a new system, such as my Azure Tridion 2013 SP1 instance (Medium instance, SQL Server 2012 instance type, runs great!). Following Nuno’s guide we can quickly get one setup. However, debugging it and finding small problems is sometimes not so easy. I hope this small tip helps show some insight into one potential issue and how to solve it. This is a known issue and to solve it you can download hotfix 87411 from this link after logging into TridionWorld download https://www.sdltridionworld.com/images/CM_2013.1.0.87500_tcm89-21270.zip Special thanks to Raimond Kempees for the information about this hotfix. I removed the old DLL and put the new one in, started my Tridion services and CMS website up and was ready to rock and roll. Now it’s time to get my Blueprint created, starting with my Empty Master! 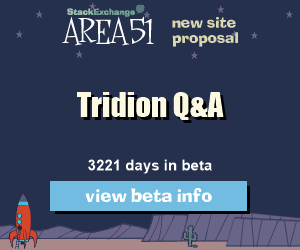 Today the best and quickest way to get an answer to your Tridion question is at the Tridion StackExchange site. StackOverflow was created in 2008 and shortly after in 2009 they opened up the platform for other topics to have their own Q&A site. 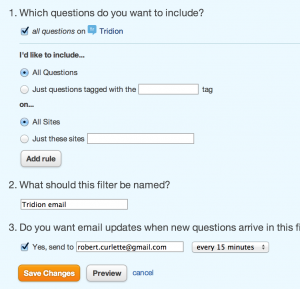 In 2009 the only place for having Tridion questions answered was the password-protected Tridion forum. Created in 2001 the forum was a great place for asking and answering questions in the small but active Tridion community. However, over time it got a little slow and more difficult to find answers to questions. It was also only open to those who had a login from Tridion Customer Support. It’s possible to configure StackOverflow to send us an email when a new question arrives. Some people keep the Tridion StackExchange site open in a tab (and the # of new questions shows immediately), however, I prefer to use the email method. Over the Christmas holidays I disabled all my auto-emailing scripts and until now have not had it enabled. I noticed I visited the site a lot less, and also answered a lot less questions. Enabling the email trigger is not so straight forward and here I want to describe how to set it. I have the website send me an email 15 minutes with the new questions and this helps me to answer faster and also keep up to speed on topics related to Tridion. I am a big fan of automation and the email filter was the best way to stay on top of the forum and also answer more questions (= more points). However, recently it got disabled and as a result I stopped visiting so frequently and also my points started to lag. I hope you enjoy this tip. I also like to automate the opening of my timesheet (and other routine tasks) and previously wrote an article about automating Firefox to open at the same time every day to my timesheet site. Good luck with automating these tasks to make them painless. The first Tridion Developer Summit will be held on 15 May in Amsterdam at the Undercurrent. We have 8 sponsors, more than 15 speakers and expect around 100 developers to attend. It’s less than 80 days before the event starts and I thought I would give some info and background about the event and how the ideas came together. The idea for the summit started last year around the time of the Tridion MVP summit in October. I thought it would be great to have a lot of Tridion developers in one place, for us to share our ideas and experiences together. To create a unique and fun experience for everyone. I wanted to have it in October, but realized there was not enough time to organize it and instead arranged a Tridion reunion for my former colleagues and I to meet and share some drinks. After the successful reunion I had more confidence about organizing an event and I decided to explore the idea of a Tridion Programming conference. I discussed the idea with Quirijn Slings, Ron Grisnich, Nuno Linhares, Dominic Cronin, and Minko Scheltinga. We all agreed it was a great idea and we got started on the planning. After a short while I was knee-deep in venue options, dates, schedules and speakers. I needed to decide on a place and a date, and quickly, because many places were booked for months or years in advance. After much discussion with many places and dates, but without much luck, Minko and Quirijn suggested an area in Amsterdam North filled with old warehouses and artist studios. Here we found our ideal venue – big, authentic, ‘urban chic’ and right on the water – actually, the venue is floating on the water. And, the manager of the venue called me right away and seemed to really understand the unique experience I was hoping to create for the conference. To top it off, we can arrive by boat in the morning and depart by boat in the evening. The next step was the agenda and sponsors. I contacted several Tridion developers and asked if they would like to give a talk at the Summit. They all replied with an enthusiastic ‘Yes!’. This is one of the things I love about the Tridion community – it is small, but filled with great individuals that really like to participate and help others. With the speaker list and agenda starting to take shape I contacted several Tridion partners to ask for sponsorship – and just like the speakers – everyone was very positive and most agreed to sponsor. Although it is an independent event, SDL immediately offered their support and we’ll have the Friday workshops at the SDL offices and also have the SDL film crew with us on the event day. From SDL I am happy to have the help of Nuno Linhares, Ericka Marquez and Jeff Hora. Check the sponsors page to see our great sponsors. With the venue, speakers and sponsors in place I was left to find a name for the conference and also get the website up. The name Tridion Developer Summit is a wordplay on the old ‘TDS’ object we would often use in the templates to get objects from the system. Originally TDS stood for ‘Tridion Dialog Server’ and was the name of the product when I joined Tridion in 2000. Ron Grisnich of Trivident took the lead for the Facebook page and before I knew it he had it set up and also tweeted the event. For the website I decided to use an existing Event theme from WordPress instead of designing and developing the event site from scratch. After all, there is a lot of time and effort needed in all the things to organize the event itself, and I decided not to spend time programming the event website. Hendrik Beenker from Indivirtual contacted me right away and asked if I needed any design help for the site. I said I would like help with the logo. He understood the requirements and very soon I heard that Robin Bes, a senior visual designer at Indivirtual, was available to help us. After a couple of iterations we decided on the current Tridion Developer Summit logo, and I can say I am very happy with the results. He managed to incorporate the SDL logo, old Tridion boomerang, and also it appears as a mountain, or summit. Well done! And that takes me to where we are today. We’re fine tuning the schedule, have a great list of speakers and are still looking for few more sponsors to help us make the event a big success. We are planning to arrive at the venue in the morning by boat from central Amsterdam to dock at the venue, but we also have 600 parking spots for those by car. We’ll have a prize giveaway at the end, based on some trivia questions. We’re also planning the pre-event evening (most likely a boat ride through Amsterdam) and Tahzoo offered to sponsor the drinks after the event. And, who knows, maybe some live music from the Tridion community as well. Thanks a lot to everyone so far for your support. I am really excited about the event and looking forward to an amazing day. Follow us on twitter @TridionSummit and also on our facebook page. You can register on the Tridion Developer Summit website if you would like to participate in the Tridion Developer Summit 2014. Sometimes our best advice comes from within – things we know but aren’t aware of. I have a list of ‘interesting articles’ I emailed to myself in 2013, to finish the year with a look back and also gather inspiration for 2014. I hope you find them as interesting as I did this year. Do you have interesting articles? Please share in the comments. Thanks and enjoy! SDL Tridion Context Engine: What’s the context? I love the ServiceStack framework – it is a super efficient way to build Web Services, parse JSON, and interact with a database. Most of my GUI Extensions use the ServiceStack library and I would suggest you to have a look in 2014 if you haven’t yet. SignalR allows us to glue disparate systems and let them talk to each other through broadcasted events. This allowed me to show messages in the Tridion MessageCenter GUI (JS) from distant C# code in the Tridion Event System or a Custom Resolver. It’s now officially part of ASP.NET and is a very interesting technology. Great perspectives from software veterans on the quality of software today. Alternative solutions for the .Net platform. I have a good feeling that F# is the future and our OO code today will look like Cobol in the future. Game programming framework that uses LUA to write code and compiles to Android and iPhone. Also, Free! 99u is amazing. Every week I read something from them that inspires me to improve the quality of my work or my life. Follow them on twitter @99u. 99u: Secret to feeling energized at work – Autonomy! The GUI Extension installer does everything on the CMS to install and register a Tridion GUI Extension, saving you time and letting you try out new GUI Extensions easier and quicker. The idea was started at the Tridion MVP retreat and then I continued working on the installer after the retreat. Special thanks to Dominic Cronin for sharing some PowerShell secrets to help me get started. Have fun and please leave feedback!